This is the second edition in a series about the elements of design. We are going to talk about space and how it effects and works in decorating. Space is something we think about without really thinking about it. It is part of our unconscious make up. But as a decorator being aware of the space we live and work and decorate in is VERY important. Let’s discuss this important element of decor. On the podcast we are talking about EASY FALL CENTERPIECE IDEAS. So much fall inspiration! You can read about The ELEMENT OF DESIGN… BALANCE HERE. It is the first in this series. Let’s talk about SPACE! 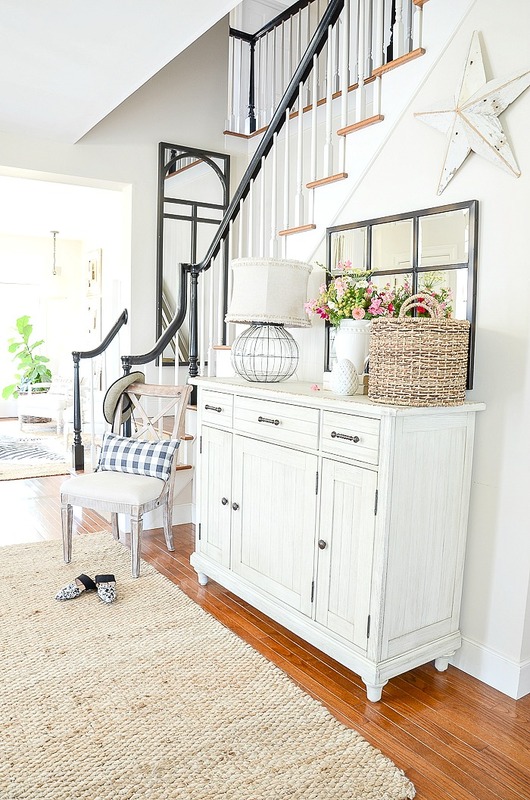 I’m featuring my foyer because I think it shows a very easy to understand example of “space”. Why is it so important to learn about the design element space? Because if given the proper attention a room can be more beautiful and more balanced if space is considered. You would be surprised by how the way you look at space in your home can add or detract to the comfort and appeal of every room! Simply put, space is the amount of area in a room you have. And it usually is limited so we need to best know how to work within it. Space is defined as the walls, ceilings, floors, windows, doors, and architectural things in a room.n It is the space contained within these things. My foyer, although open does have very definite walls, doors, windows, floor, and ceiling. The little side wall next to the coat closet defines the limit of the space in the foyer. As does the first step to the upstairs. There is both positive space and negative space in design. Empty space is called negative space. And anything inserted to a room is called positive space. Simple so far, right? Think of positive and negative space this way. Let’s say we are getting ready for a special dinner out with friends. Our bodies are negative space. And every little thing we put on them is positive space. We need enough positive space to not be indecent when we go out. We need positive space to adorn an outfit with jewelry and shoes and handbags and maybe a wrap. Makeup and hair bobs also add to the positive space. But if we put on too much jewelry or add too many layers of clothes or add tons of makeup we will look overdone, to say the least! When we dress for an evening out our goal is to look attractive, have enough clothes on to be respectable and add just enough embellishments to add to our overall look. Now take that example and think about a room in your home. The negative space in a room needs to be filled with just enough positive space to look “well dressed”. Not overdressed and certainly not underdressed! It’s easy to see that the foyer has lots of negative space because it is necessary for room flow and traffic patterns. 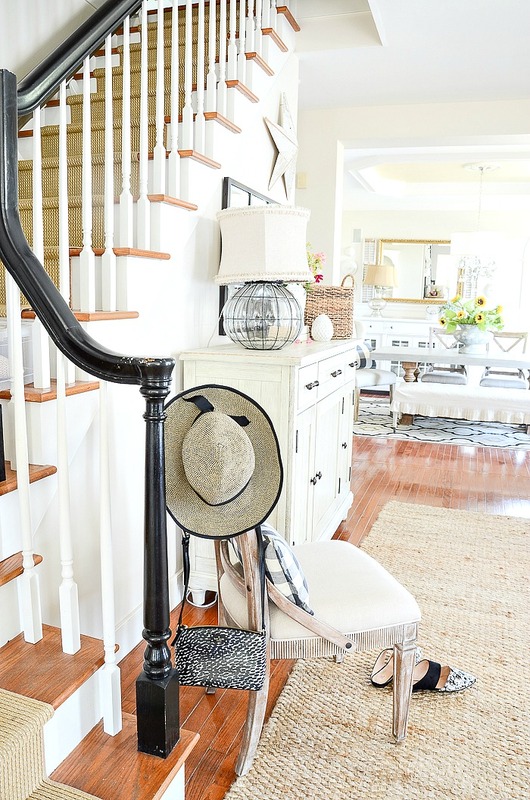 But this foyer has positive space that “dresses it up” and makes it attractive and welcoming and livable. Although a room has a defined amount of space we can make it seem bigger or smaller by what we put in it. Here’s where light can be a player! The right colors put on the things that define a space (walls, ceilings, floors, etc) can make a room look bigger and spacious or smaller and cozy. Light reflects and can fool our eye by creating the illusion of more space. Just as dark colors can do the opposite. How a room is divided by furniture (positive space) will also affect the feel of space in a room. The big challenge for a home decorator is to strike the perfect balance between positive and negative space. We need to fill up a space with just the right amount of furniture, layers, texture, accessories etc to make it comfortable to live in and attractive as well. But we also need negative space to give our eyes, mind and soul rest! We need to think about how we use spaces in our home and balance negative and positive space accordingly. Too much of a good, like positive space, is not a good thing. 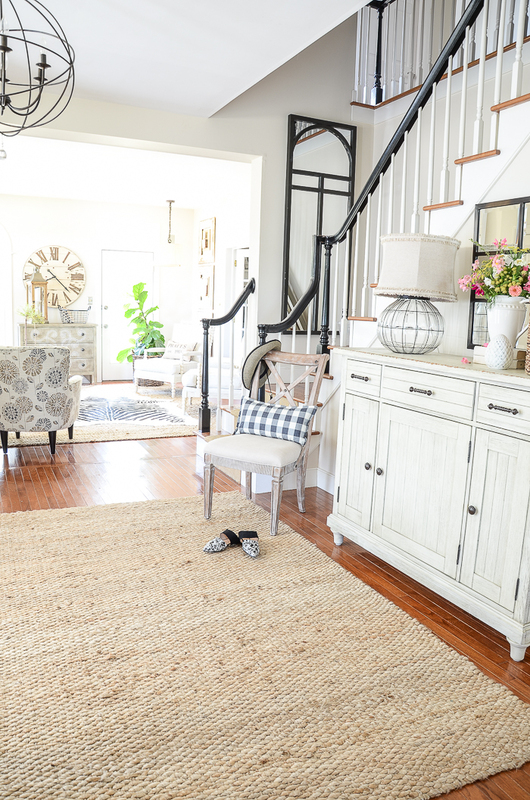 Many decor enthusiasts might tip the scale in favor of positive space. 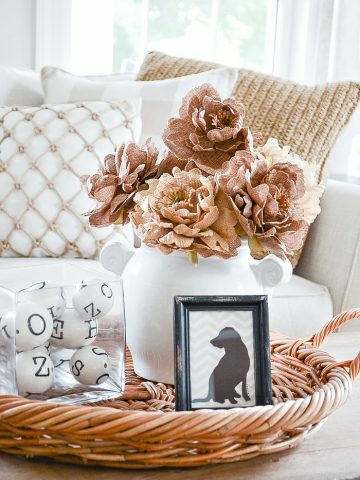 Try giving a room with lots of trappings a little more negative space. 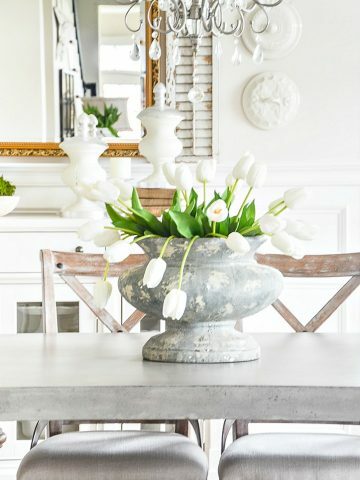 If you are like me the balance of positive and negative space in decor is not always easy. It’s really a matter of trying and retrying and editing and adding. Think of it as “playing”. 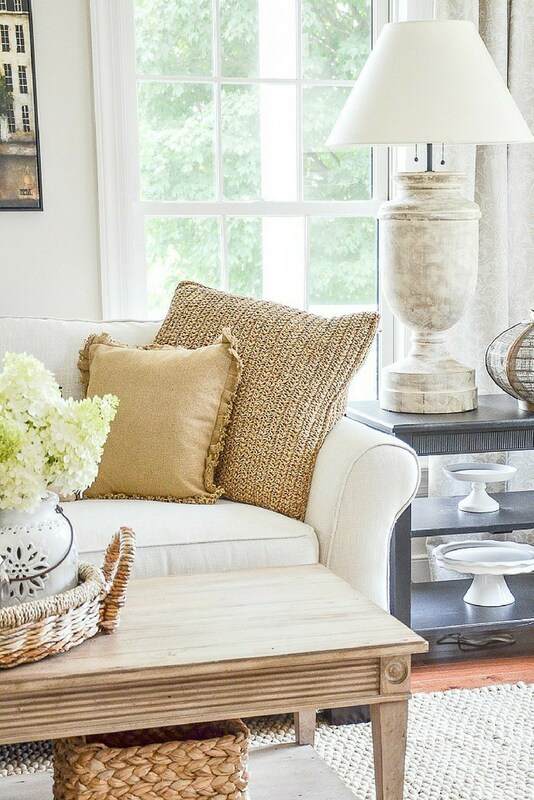 The better you are at using the design element space the more beautiful your home will look. Great information. I have been leaning towards more negative space, lately, and now it makes sense. It is much more calming. Thanks, once again, for explaining this concept. 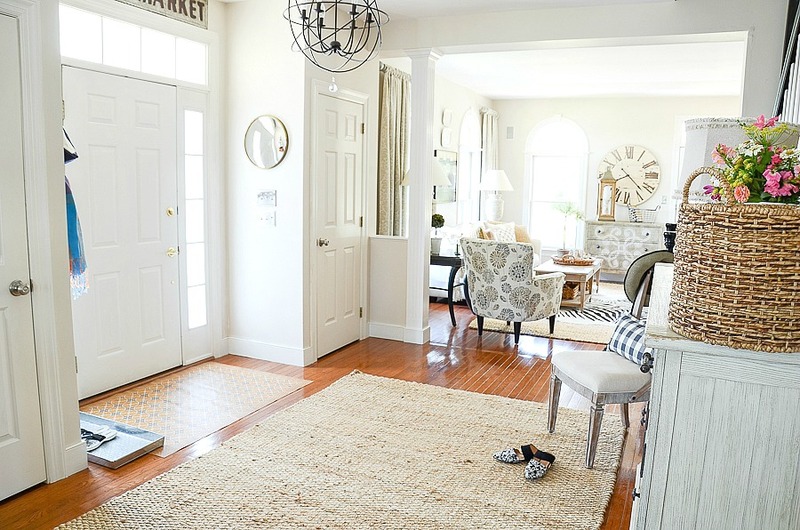 Hi Yvonne, my home is French style, but I have always loved the way that you decorate. Today, I really looked at your photos as I read your excellent insight and realised why I love it and eagerly look for it to turn up in my inbox. My home iis in similar colours and I am drawn to your balance and symmetry which is like mine and gives me a sense of calm.I believe that calm is added to by the negative and positive space that you shared about. Thank you for your sharing your lovely home and blog. Looking forward to your next post. Hi Angie, thank you! Space is so important to think about in our homes! 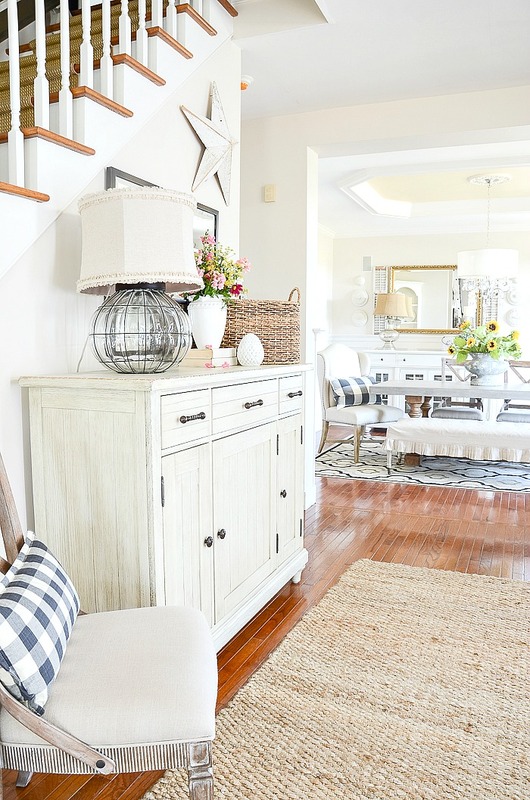 Yvonne, I love your Blog and have enjoyed the article in “Cottage” featuring your home. I am searching for your neutral wall cover paint on your blog. Can you possibly post your color numbers? thanks for such a great blog. We are planning to downsize soon and although our square footage will be going down I still plan to brining in some larger pieces such as an armoire for a smaller TV in our keeping room, the bottom of an older hutch to be reworked into a kitchen island, etc. I have read that you can still use a large piece in a small room if done right. My wall colors will all be very light, simple draperies in solid cream color, and I do not do a lot of knick knacks, but use simpler larger items to display. Hopefully, this will all work out in our new space. Decorating a home is a lot like wearing jewelry – you don’t have to wear everything you own at one time. I enjoyed this post very much. I wish you bundles of blessings in your new home Lyn! And you are right! It’s a fine balance. I’m decorating with more big, less small. 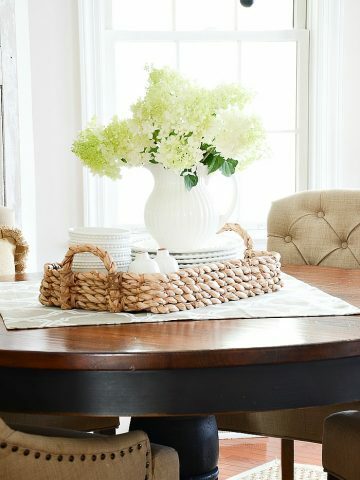 When I create a vignette for the season, I like to walk away, come back with fresh eyes, many times removing an item. Joanna, great tips! I do the same! Great post, Yvonne! Learning lots! You have been a great influence on me for quite some time, both in decor, and in things of the Lord! 😉 Hugs! Awwww, thanks, Julie. You are such a wonderful friend! Yvonne… I’ve been reading your blog for years, and listening to your DTT podcast since the beginning. I had to take time to comment that I love this new Elements of Design Series that you are doing. Learning so much from your explanations and the photos that illustrate them. BTW, I’ve been searching forever for a lamp similar to that in your foyer, and I hope one day I will find one just like it! Hi Mary, I found the lamp at my local Pottery Barn Outlet years ago. Very interesting comments, I never thought of space being negative and positive . I guess that is why I never liked thing in the corners. Our first home was a VA track(builders choice). All the rooms were painted with a color called Desert Rose. It was small enough with out the paint. But we loved that little house. We also live and learn. Thanks for the examples. Your home is beautiful. 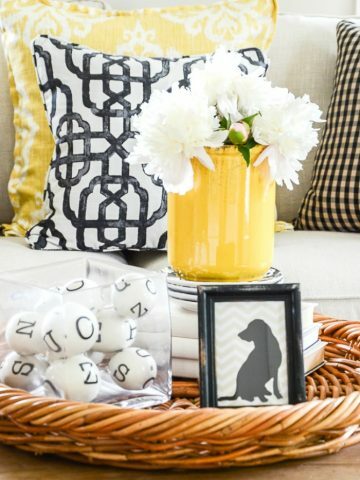 The tips of design and decorating are very helpful. Have a great day. I know! Aren’t they cute shoes? Speaking of those darling shoes…can you share where you found them? I found them at a local shop. Very interesting lesson this morning. I have found that if I feel a sense of discomfort while in a room that it is generally due to what you call positive space that has been overdone. In my own home I know it is time to remove that extra pillow or one too many pieces of artwork on the walls ect. When I feel a sense of relaxation I know it’s right for me. That’s a great way to put it Kathy! I have not thought about space as positive or negative. My floor plan is open so it is difficult to section off areas. My front door opens to the entire living, dining, and kitchen! I do have 2 beautiful columns that separate the dining area but the rest is open. It is a challenge to place furniture so it is balanced in an open floor plan. Your information about space and balance is very helpful. I wondered where you kept your extra dining chairs and now I see there is one in the foyer! Good idea! The other dining room chair is up in my bedroom sitting room and we use it to sit at a desk. They are very comfortable. A good article. Negative space can be a challenge, especially in a home of 2000 square feet or less!